Here are a few plans for building water collectors suitable for use with any of our guzzlers. Collectors are commonly built in two different designs: single roof and the double-wing design. Both work well for collecting rain water. The materials used to build the collectors are readily available at most building centers. Roof over the top of guzzler. Popular design for upland birds. Helps keep larger animals out of guzzler, and reduces evaporation. Works well with the "Full-Ramp" guzzler design. Same basic design as "Single Roof" shown on the left but is placed off to one side. This leaves guzzler trough open for deer and bird to access. Works well with the "Dome-Top" guzzler design. This double roof directs water into the center of the guzzler. 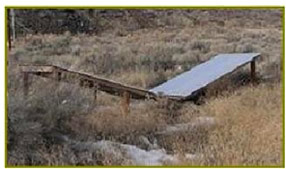 It leaves the back end partially open for deer and the front end open for bird and small game to access the ramp. Tarp collection is a simple and inexpensive way to add a lot of square footage to your collection system. You'll need to check the tarp periodically to make sure it stays in place. 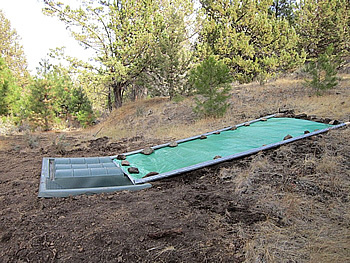 Note that if you are using your guzzler in a CRP or similar program, you may be required to build one of the standard roof systems shown above. However, you can also add a tarp system to expand your collection area beyond the roof system. In some very dry areas, you can benefit from all the collection area you can get. Every square foot of collection surface will give you .6234 gallons in the guzzler. Both sets of plans utilize 64 sq ft collectors which is suitable for about 12" precipitation. This is common for the Columbia Basin region of Washington and Oregon. Your region may differ. How Big of a Collector Roof to Use? The NRCS Conservation Practice 614 - Job Sheet is a helpful informational guide on Wildlife Guzzlers and Water Collectors. Below are Collector Roof calculations based on the NRCS calculations within this document. Keep in mind that roofs reduce evaporation, provide cover for birds, and helps keep large mammals out of the guzzler. The Oregon NRCS recommends that your collection system produces 1.6 times the guzzlers storage capacity. This helps to take into account time between rainfall. Here are a few examples of how many gallons you can collect from 1" of rainfall with different size collection roof systems. 1" of Rain equals approx. For every 1” of rain and 100 square feet of impermeable surface, about 62 gallons are generated. This means you can capture about .62 gallons per sq ft. for every square foot of collection roof or the lid of the guzzler. Adding a "collection roof" is the most common way to increase the total "collection surface area". But, it is also important to take into consideration some of the weather variables present in your region. As such, planning guides for a particular region will often use a specific "multiplier" in their calculations to compensate for these various regional factors such as evaporation and hot summer dry spells. For example, the Oregon Planning Guide from NRCS uses a multiplier of 1.6. Whereas in Arizona, they will use a higher multiplier of 2.5 to compensate for the higher temperatures, increased evaporation and prolonged dry spells. AZ Planning Guide. Below are two examples using the Oregon and Arizona multipliers. The multipliers are determined by the respective NRCS Planning Guides. We will try to make these numbers and links available when possible. These two examples of use the Dome-Top 500 guzzler: Capacity 500 gallons. Guzzler Surface area 42 sq ft. Example One: Oregon 1.6 multiplier. 8" rain per year. Min. 8" Avg. Annual Precip (inches) = Total Collection Surface Area (ft2) 100 Sq Ft. Example Two: Arizona 2.5 multiplier. 8" rain per year. Minimum. 8" Avg. Annual Precip (inches) = Total Collection Surface Area (ft2) 156 Sq Ft. Covered Guzzler. Less evaporation and keeps water cooler. Reduces UV exposure and limits algae growth. Helps to keep large animals out. 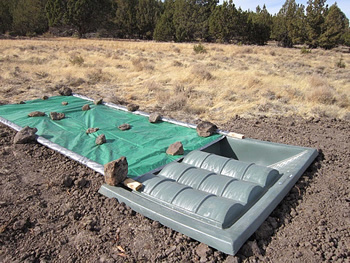 Provides some cover for upland bird. Good for Full-Ramp 500 guzzler. Uncovered Guzzler. Allows all animals to access water. Provides greater collection surface area. Better for Dome-Top 500 and 1000. Large Animals vs Small Animals. Deer consume more water then small animals and bird. If your guzzler is focused on upland bird, you can reduce your collection roof size.